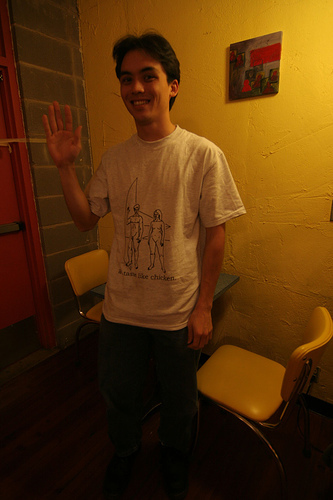 Coffeeghost » Blog Archive » Geek T-shirt – "We Taste Like Chicken"
Geek T-shirt – "We Taste Like Chicken"
The image was engraved on Pioneer 10 and 11, which were probes launched into deep space. The idea was that intelligent alien life would find these plaques and interpret them to mean that intelligent life (us) existed elsewhere in the galaxy. I offer an alternative interpretation.